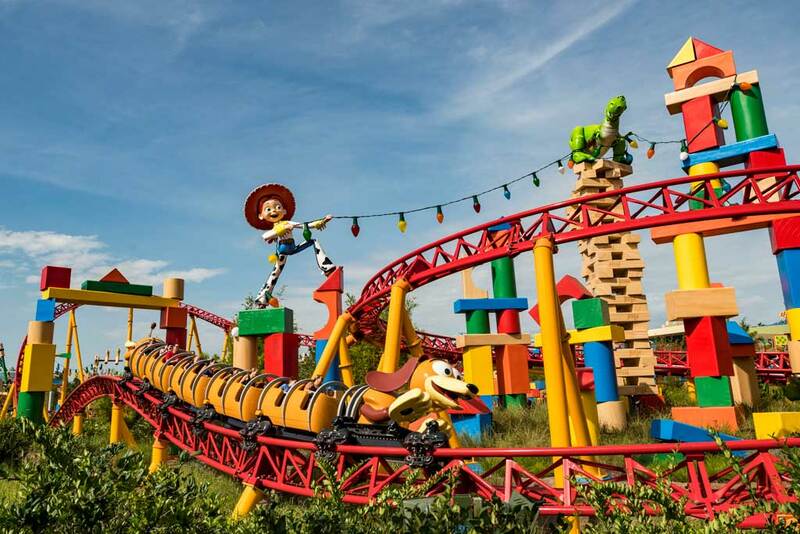 LAKE BUENA VISTA, Fla. (June 28, 2018) – Jumping on the coolest canine toy ever, guests are in for a rollicking good time as Disney’s Hollywood Studios unleashes Slinky Dog Dash in the new Toy Story Land at the Walt Disney World Resort. This multi-launch, family-friendly roller coaster careens around bends and “catches air” over camelback humps as it runs across the 11-acre land. As honorary toys, guests have Andy of Pixar Animation Studios’ Toy Story films to thank for this incredibly fun experience. 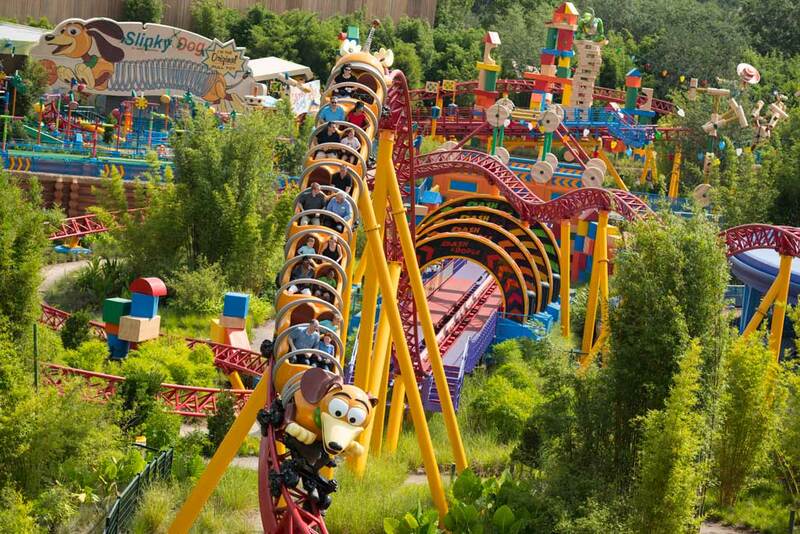 They get to ride his creation and be inside Slinky Dog’s coils as the lovable pooch twists and turns around the track. It all takes place in Andy’s backyard, where he used the Dash & Dodge Mega Coaster Play Kit to assemble this speedy toy. 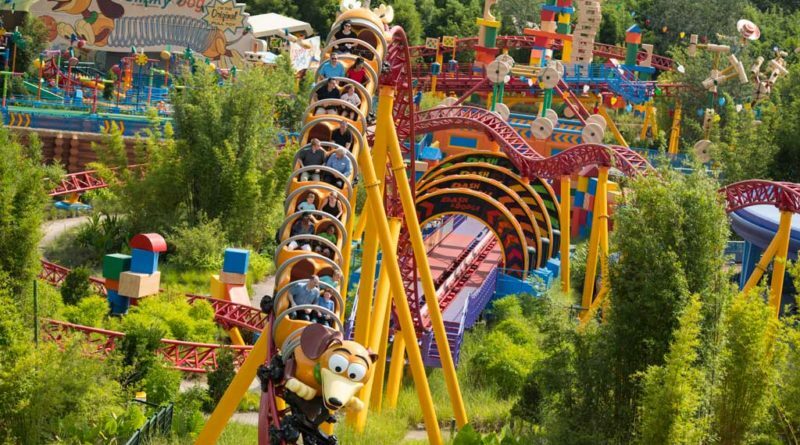 Andy’s idea for his double-launch coaster – a Disney first – was to pick everyone’s favorite floppy-eared dachshund with the stretching coil body – Slinky Dog – to send guests around the track. The attraction’s ride vehicles are spring-tailed spinoffs of Slinky, the iconic American toy from the 1940s. Track and supports for the coaster are done up in bright colors of red, orange, yellow and blue. Guests approaching the ride launch see Andy’s plans sketched out in Crayola crayon on notebook paper. Glue bottles, empty toy boxes and stray coaster parts and pieces are strewn about – Andy’s pet project was clearly a work in progress when he was called away. But that’s when the toys will play! In one hilarious scene, the coaster swoops around blocks Andy stacked around his Jenga game. Rex, the toy dinosaur, is precariously perched atop the unstable Jenga stack trying to decorate the toy block city by stringing up colored Christmas lights – a daunting task when you’re a dinosaur with short front arms! Jessie comes to his rescue, working to untangle Rex’s dino-sized predicament. Andy also tricked out his coaster creation with a power booster. When Slinky Dog Dash hits its midway point, the coaster stops, reverses a few yards, then shoots through multiple rings pulsing with sounds, spinners and flashing lights to launch riders into the second act of the ride experience. 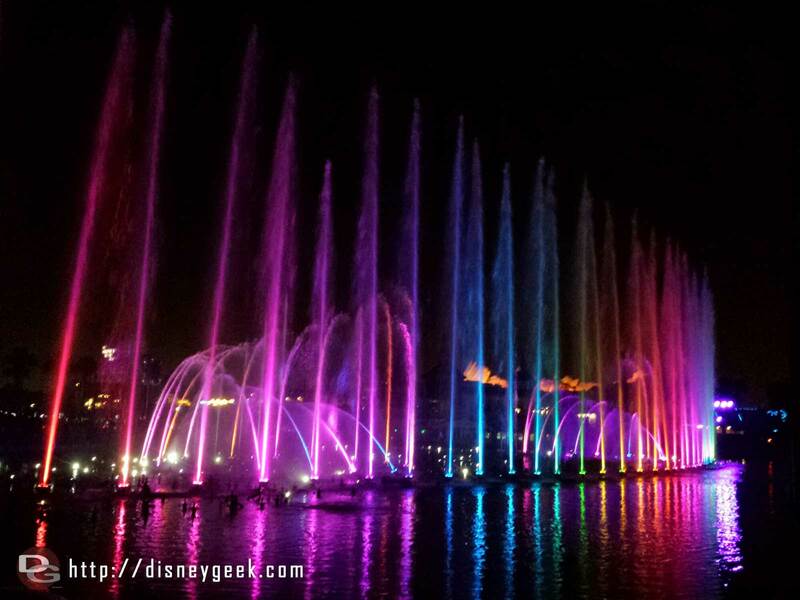 “The first half of the ride is many swirls, turns and dips, and after the second launch come a drop and camelback humps – as if you were playing with a Slinky Dog toy,” explained Dave Minichiello, Executive Creative Director of Walt Disney Imagineering.